Because Windows 8 will run on laptops, ultrabooks, and tablets as well as desktop PCs, access to mobile networks is important. On the Engineering Windows 8 blog on Friday, Windows president Steven Sinofsky detailed five improvements to Windows 8 that will simplify connecting to mobile networks and managing network connections. Here's a recap of the changes to watch. 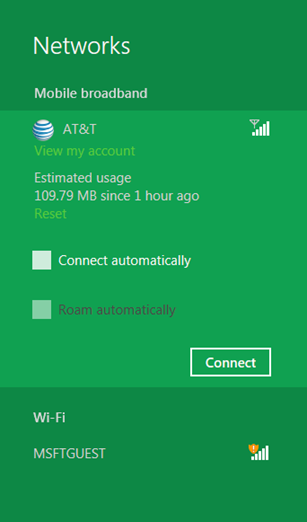 Carrier and usage data appear here. Windows 7 loosely supported mobile broadband, but often required the download of drivers and management software. Just as native Wi-Fi management was integrated into Windows XP, mobile broadband will have native management in Windows 8. And to prevent the problems associated with downloading drivers, Microsoft worked with mobile broadband hardware partners to develop the Mobile Broadband Interface Model (MBIM) standard, which provides a driver that will work with all of its offerings, and will be kept up-to-date through Windows Update. 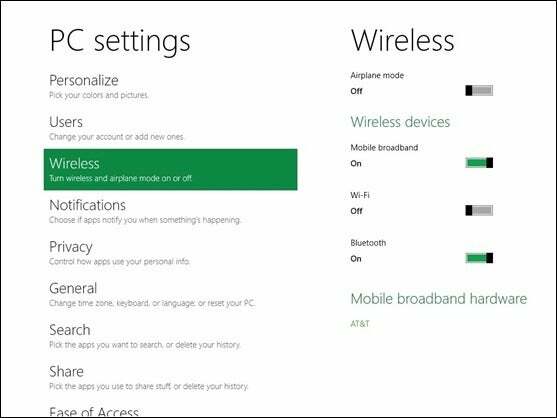 Windows 8 will automatically detect your mobile broadband carrier based on your device or SIM, and configure your device to connect to your account. If you don’t have a data plan, a Connect button will take you to your desired carrier where your options are listed and available for signup. Once connected, Windows 8 will provide a counter to show how much data you’ve used on your various connections to help avoid bill shock, especially important if your business is trying to get by with a small mobile data plan. There's also a quick option for airplane mode. Smartphones have always had to handle multiple data connection types, but this type of management is new to Windows. Windows 8 will allow you to enable and disable the different Wi-Fi, mobile broadband, and Bluetooth radios in your device. It will also offer a feature common on most smartphones, “airplane mode”, which disables all radios with one setting, a great option if you fly often. Windows 8 will provide an interface that displays all Wi-Fi and mobile broadband connections at once, aiming to make it easier for you to choose the best option. Selected networks are remembered in an ordered list, giving preference to networks more recently joined, and forgetting those from which you manually disconnect. 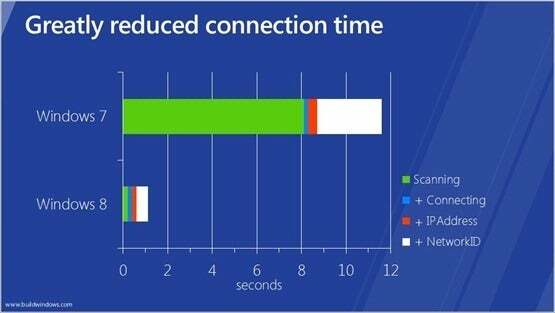 Windows 8 also is aware of the cost of each type of network--not in dollars, but in the measure of latency and likelihood of bandwidth restrictions and data caps. On more “costly” networks, Windows will change configuration settings, for instance, delaying non-security based Windows Updates downloads until Wi-Fi is in range. Microsoft says the time resuming from standby will take just one second, down from 12. Where desktops are generally either turned on or off, and networking easily loads in the time it takes to boot your computer, mobile devices tend to have a standby mode, where it is running but using as little power as possible. Resuming from standby mode requires powering back up hardware like network radios, and re-establishing a network connection. Where this might take nearly 12 seconds in Windows 7, Windows 8 has been re-engineered so it should establish your network connection in about one second, eliminating the wait time so you can get right to work. Windows 8 is far more mobile-conscious than its predecessors, but there is still room for improvement. Though data usage is displayed, and Windows Updates can be delayed on a "costly" connection, Microsoft makes no mention of a quota setting that could allow you to disable a connection when its data cap has been reached. This could be invaluable in roaming situations with small data plans. Details like this would make Windows 8 an even more powerful tool for mobile workers. Joseph Fieber has 25 years experience as an IT pro, with a background in computer consulting and software training. Follow him on Google+, Facebook, or Twitter, or contact him through his website, JosephFieber.com.